Tapestry Kaleidoscope Jasper is a relative of Kaleidoscope Jasper. It is so named because the stone, after cut and polished resembles a tapestry. The stone is from the Mitchell, Oregon area of the US. What sets the setting apart from others is the unique angular shape of the stone. Further adding to the design are the angular edges polished into the stone. The stone is set in a Sterling Silver bezel with a very generous bail to accept a snake or cobra chain from your collection. This pendant is offered as pendant only. $179.00 including free shipping within the US. 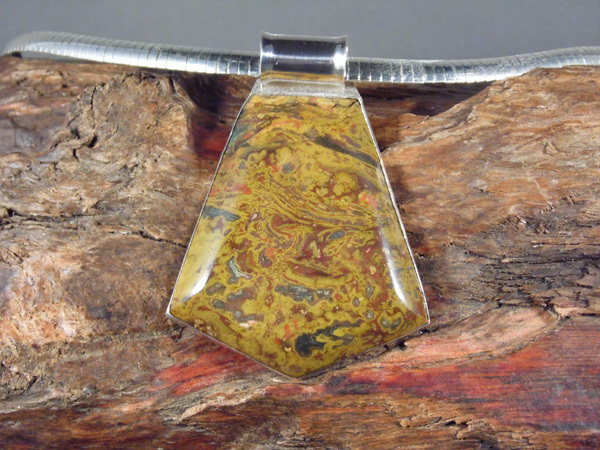 This Tapestry Kaleidoscope Jasper Pendant is approximately 2 3/4″ tall, including the bail, and 2″wide.